Devolution in the UK has meant that the non-English nations have divided government control over major areas of public policy. On some matters, UK government policies still affect people directly; on others it is the governments in Edinburgh, Cardiff and Belfast that decide. Though devolution itself has great potential in theory, the division of control creates the potential for public confusion: do people actually know which government is responsible for what? Public knowledge matters for democratic accountability. If people don’t understand which government does what then they cannot hold the relevant politicians accountable at elections. Some may receive blame, or credit, which they do not warrant; others may escape deserved responsibility. The evidence thus far has not been encouraging. Previous studies in Scotland and in Wales have shown plenty of confusion about which government does what. Some work has also shown an asymmetry of policy attributions: with people in both Scotland and Wales tending to blame government in London for perceived poor performance in major policy areas, but giving credit to governments in either Edinburgh or Cardiff where things are believed to have improved. This may be convenient for some politicians in Holyrood and Cardiff Bay, but it is not politically healthy in the long-term. Recently, however, there has been a major attempt by the Conservatives to address this problem in Wales. This has not stemmed from high-minded concern for democratic proprieties, but from raw politics: with public perceptions of NHS performance in Wales being poor, the Tories have wanted the Labour Welsh government to get the blame. Labour’s management of the NHS in Wales has been attacked in vitriolic terms, and the Conservatives suggested that this is emblematic of broader Labour incompetence. Is this having any effect? And on health, or indeed in other major policy areas, are Welsh voters approaching the forthcoming National Assembly election with a clearer idea of who is responsible for what than they did in previous elections? To explore these questions, I’ve examined evidence from two major academic surveys: the pre-election wave of the 2016 Welsh Election Study, conducted in early-mid March this year; and the first wave of the 2011 Welsh Referendum Study, conducted at almost the same time before the 2011 National Assembly election. A near-identical set of questions was run in the two surveys. 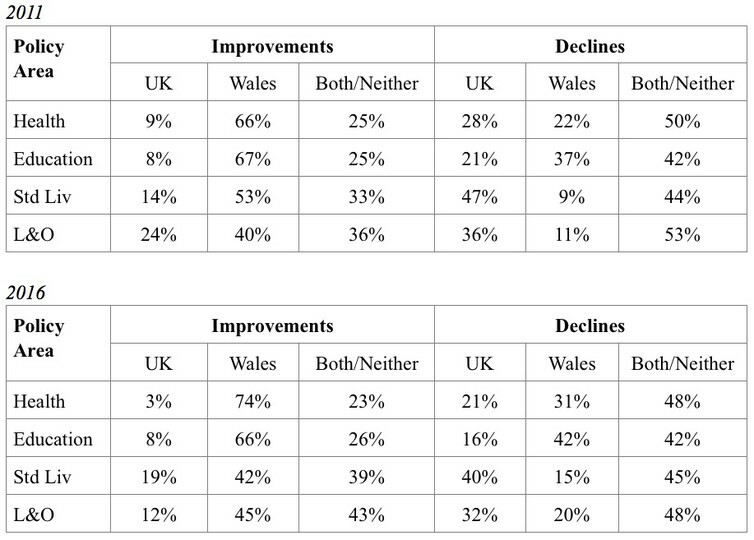 These asked, first, whether people perceived improvements or declines in key areas of public policy since the previous National Assembly election; and, second, whether people attributed any improvements or declines mainly to the UK government, the Welsh government, or both equally. Four topics were asked about: health, and education, high-profile areas where policy responsibility has been largely devolved, and “standard of living”, and “law and order”, areas where power and responsibility largely remains with the UK government. 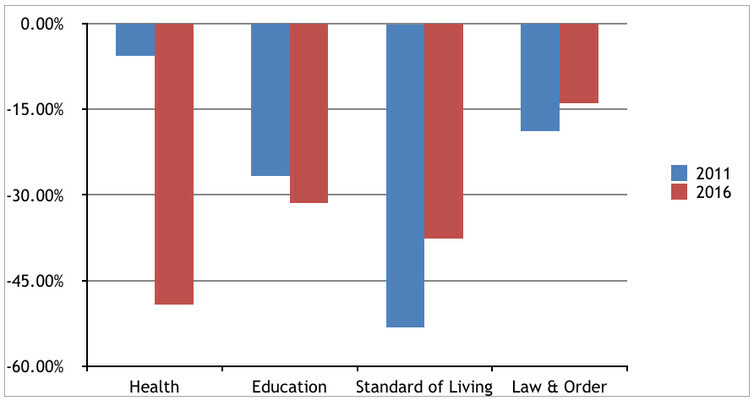 The figure below shows the balance of opinion (the net percentage of those perceiving improvements minus those perceiving declines) in each of the four policy areas in both 2011 (blue) and 2016 (red). A few things are noticeable here: first, the balance of opinion on all issues is negative. In both 2011 and 2016, across all issues, more people perceived decline rather than improvement. Second, and perhaps most strikingly, there has been a huge decline in public perceptions in the area of health between 2011 and 2016. Even if they haven’t caused such perceptions, attacks by the Conservatives and others on the Welsh NHS will likely have chimed with many voters’ views. Finally, in the two areas under Welsh government control, the balance of opinion has become more negative since 2011, while in the two areas of UK government responsibility, public perceptions have become less negative. But were perceived improvements or declines actually attributed to the “appropriate” level of government in any of these policy areas? Investigating this requires some careful unpicking of the data. Below are two tables, one for 2011 and one for 2016. They chart which level of government was assigned primary responsibility for perceived improvements or declines in each policy area. We see that in 2011, those perceiving improvements in health and education in Wales tended to view the Welsh government as responsible. This is encouraging; much less so is that many people also credited the Welsh government for improvements in those areas where it had much less power. We also see that people who perceived declines were substantially more likely to blame the UK government than those perceiving improvements, and that this was true both of devolved and non-devolved policy areas. Have things changed? Our new evidence suggests that they have, to some extent, in the field of health. Compared to 2011, Welsh people in 2016 are more likely to assign responsibility to the Welsh government for policy outcomes in health, whether it is for improvement or decline overall. But in the other policy areas there is now a clear general pattern, and there remains a tendency for people to be disproportionately likely to give credit to government in Wales, but assign blame to government in London. The long-term health of a system of devolved governance surely requires clarity of policy responsibility. In Wales, the latest evidence indicates that the strong political attacks that have been made on the Welsh government’s management of the NHS may have induced greater clarity for many Welsh voters on this issue. However, health appears to be more the exception than the rule. In general, any clear division of government responsibility in the minds of voters, and accountability for what each level of government does, seems to remain elusive. The 2011 Welsh Referendum Study was funded by the Economic and Social Research Council (Grant RES-000-22-4496). The pre-referendum wave interviewed 3,029 respondents between 3 February-2 March 2011; fieldwork was conducted via the internet by YouGov. The 2016 Welsh Election Study is funded by the Economic and Social Research Council (Grant ES/M011127/1). The pre-election wave interviewed 3,272 respondents between 7-18 March 2016; fieldwork was conducted via the internet, by YouGov.